Welcome to the Beaverton High School Golden Grads website. This is for all alumni that attended Beaverton High School over 50+ years ago. This year (2019) we are welcoming the class of 1969. Please contact us at (503) 285-8583 for more information. Golden Grads - In 1950, 35 members of Ruth Lundgren Pasley's BHS Class of 1930 held a potlluck dinner for their 20-year reunion. Ruth reflected that she didn't believe any other BHS class had held a reunion previously. Such a good time was had by those attending, and they appreciated the friendship of old classmates, that a decision was made to have another reunion in 1952, this time in Beaverton High School. That one was so successful that they agreed to meet yearly. Word spread, and classes from other years asked if they could join in, since they had no reunions of their own. By 1975 the reunions included classes from 1925 to 1935. In 1980, the class of 1930 observed its 50th anniversary. 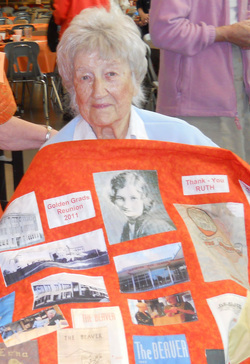 Ruth suggested calling the group Golden Grads, after a similar group at her alma mater, Oregon State University. This established the tradition of including alumni who graduated 50 or more years ago, and honoring their induction into the Golden Grads. Beginning in 1986, the golden Grads invited the Class of 1936 to join in; a representative of that class had attended the reunioin of 1985 to observe the proceedings. The Class of 1936 got its roster updated, so that an invitation could be sent to all its members. This procedure has been followed ever since. Most incoming classes have had a planned reunion of their own - a banquet or other event on the evening preceding the Golden Grads reunion. Beaverton townspeople were an important part of our lives, and many were invited. Often, one of them would give a speech, along with our old faculty members. They reminisced about both the good and the bad, bringing on much laughter and fond memories. Class members also told jokes about each other, often repeated from year to year, bringing gales of laughter. Many were stories of tricks they played on each other, and once in a while they involved some faculty member. The humor was all of a simple vein, typical of those old days when it was such a wonderful time to be teenager and we had not even heard the word "sophisticated". Until 1989, we did not have a bank account. We just kept our money in a paper bag. At each reunion, we gave a financial report. Then we did what is called "passing the hat", but since we had no hat, a paper bag served just as well. There was always enough money in that paper bag to take case of the next reunion. Our funds came from contributions for which there was little solicitation. Our reunion typically concluded with the formation of a large circle around the room, clasping hands, and singing Auld Lang Syne. Programs usually included group singing with various pianists, such as Harold Dean, Helen Tefft, Maxine Barnes, and others. The day of our reunion is like no other It is well worth the efforts of those who organize it, as classmates meet old friends not seen in years. The air is charged with smiles and warm greetings, hugs and handshakes.